With 2017 behind us, it’s time to look forward to what MSHA has in store for next year. To close the year, the agency rounded out its leadership with the confirmation of ASsistant Secretary Zatezalo and began review of pending and new rulemaking effords. This groundwork will shape the future of MSHA during the Trump Administration over the next three years. MSHA Jurisdiction: Where Does it Begin and End? The Mine Act of 1977 governs all mine operators, and grants MSHA authority over the industry. While the agency clearly has the power to regulate and inspect active mining operations around the country, its reach has limits, and stakeholders should be aware of when it is appropriate to challenge MSHA’s grasp. 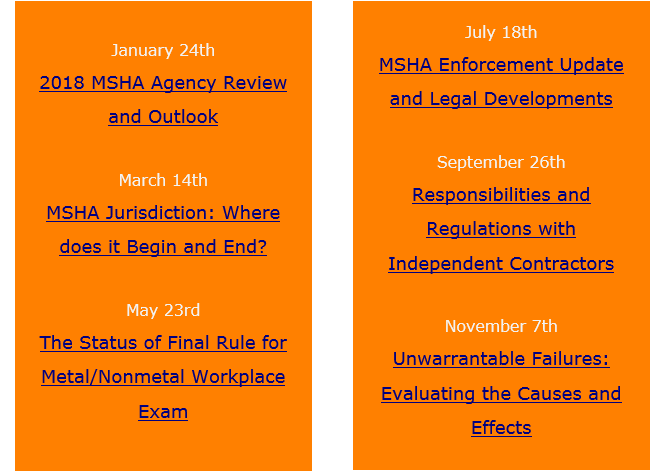 This webinar will review the limits of MSHA’s jurisdiction, beginning with the OSHA/MSHA Interagency Agreement up until the recent 6th Circuit decision in Maxxim Rebuild. How to challenge MSHA attempts to inspect operation and facilities outside their jurisdiction. With all the delays, pauses and changes endured since MSHA first released its Final Rule for the Examination of Working Places in Metal/Nonmetal Mines, it is hard to believe that was just in January 2017. While the industry has braced for the rule to go into effect on several different dates since that release, there has been consistent opposition and toe dragging to putting it into action. This webinar will review the evolution of the rule since its first proposal, and outline elements that operators, and independent contractors must adhere to when it goes into effect. As we pass the midpoint of 2018, it is important to take a moment to look back on the enforcement trends developed during the previous six months. It is also important that operators don’t lose sight of Federal Mine Safety and Health Review Commission decisions which affect MSHA’s interpretation and enforcement of the nation’s mines. This webinar will review the enforcement trends and MSHA initiatives to date in 2018, as well as the resulting FMSHRC decisions from industry contest. Operators and contractors will be able to put this information into effect for compliance and contest purposes. Strategies to prepare operations to comply with the changing enforcement tactics and interpretations. Independent Contractors continue to be in integral part of the mining industry. While contractors work at mines across the county each day without issue, production operators and contractors must be aware of the delineation of liability and responsibility when working together. Not only are there concerns of enforcement liability with MSHA for the actions of each company upon the other, but civil litigation exposure in the event of accidents or injuries. This webinar will review the delineation of responsibilities for each operator on a site, both production and independent contractor, and provide strategies for working cooperatively while protecting each company’s interests. Whether having received one, been threatened with one by an inspector, or heard of an issuance to another company, most operators have had at lease heard the terms 104(d) or Unwarrantable Failure. These are some of MSHA’s most powerful enforcement tools, and the states for additional enforcement and liability significantly increase after the issuance, in addition to the penalties. This webinar will review the definition of Unwarrantable Failures, both through MSHA regulation and guidance and the cases that govern them.